Saitama Prefecture has always been overshadowed by Tokyo, its bigger and glitzier neighbor to the south that is also the capital of Japan. But Saitama, sometimes referred to by its unflattering nickname Dasai-tama (dasai means uncool), is in fact home to a number of small manufacturing businesses developing innovative medical tools and equipment. According to health ministry statistics, Saitama ranked fourth in 2015 for the value of its medical equipment output among Japan’s 47 prefectures, at ¥116 billion. That is quite a feat considering that Saitama has no major player such as Terumo Corp. — which has large manufacturing bases in Shizuoka Prefecture. Shizuoka ranks No. 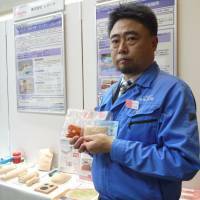 1 for medical equipment output, valued at ¥370 billion the same year. 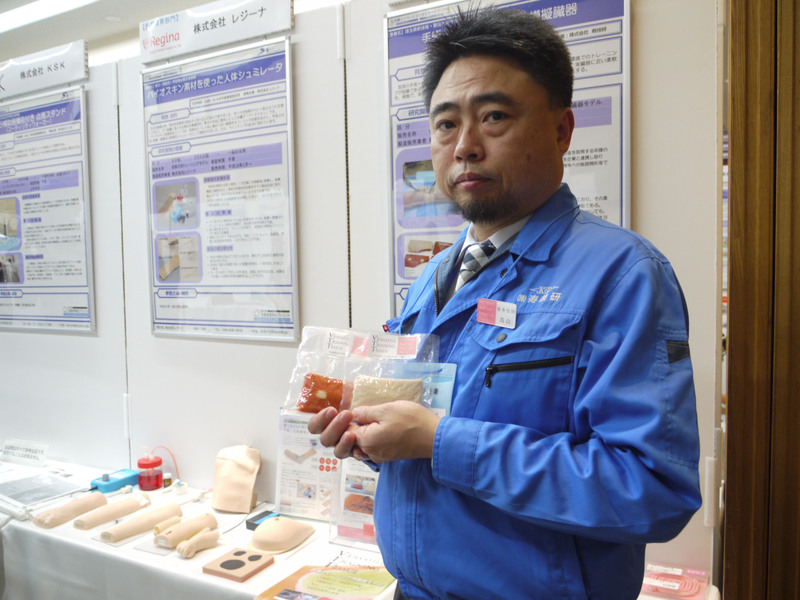 The Saitama Prefectural Government, well aware of the financial constraints faced by small businesses, started providing subsidies in 2014 to firms researching and developing medical products. At a recent event in Tokyo, the prefecture showcased some of their products — ranging from carbon-flame exoskeletons for people who have suffered a spinal cord injury and a breathing training device for people with rare neurological diseases, to mock organs for surgeons in training made from tofu and konnyaku (devil’s tongue jelly). For Seiichiro Takayama, the second-generation owner of Kotobuki Giken, a small machinery manufacturer in the city of Yashio, the idea for mock organs came a few years ago when he learned through a friend how doctors and medical students were struggling to find materials they could use to practice their surgical techniques. Operating on pig organs, which has long been common practice among novice doctors, is becoming increasingly difficult for ethical reasons. As Takayama searched for new materials, it dawned on him that restaurants served sliced konnyaku colored red with additives as an alternative to raw beef liver — a traditional delicacy in Japan — as their textures are similar. He holed up in his factory for a week and tried mixing various ingredients, such as konnyaku powder, tofu and jelly, trying to re-create the texture and firmness of a human organ. The weeklong experiment convinced him that he had a good chance of developing a mock organ from food — which would be cheaper, easier to dispose of and ethically preferable to animal organs. With funding from the prefectural and central governments, he subsequently hired a part-time worker to continue the experiment for two years. 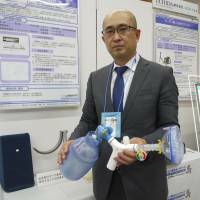 Carter Technologies Inc., based in Kawaguchi, has developed a medical device called the LIC (lung insufflation capacity) trainer for people with ALS, a severe and progressive neurological disease. People with the disease lose the ability to “stack” their breaths — a technique for maintaining lung function — as their vocal chord muscles decline. Over time, the condition of their lungs deteriorates to the point that they must rely on an artificial respirator. The LIC trainer, connected to a plastic pump, can send pressurized air into the lungs to help expand them. 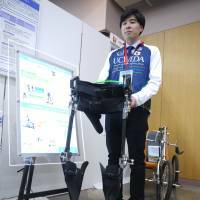 It was through an email inquiry by physical therapists at the National Center of Neurology and Psychiatry in western Tokyo that Carter Technologies, a medical manufacturer with only four employees, developed the training device. 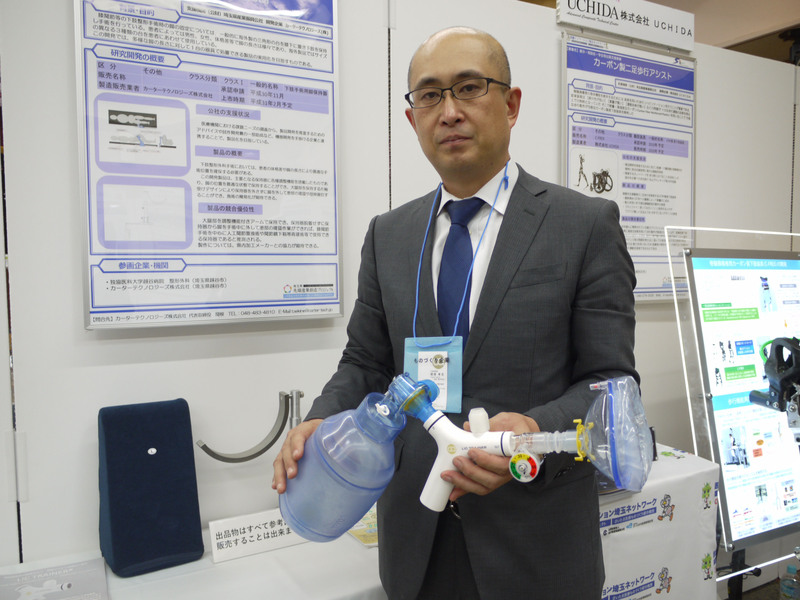 Sekine added that the device, if used daily, can extend the time before ALS patients start to need artificial respirators, and — equally importantly — help patients feel better. 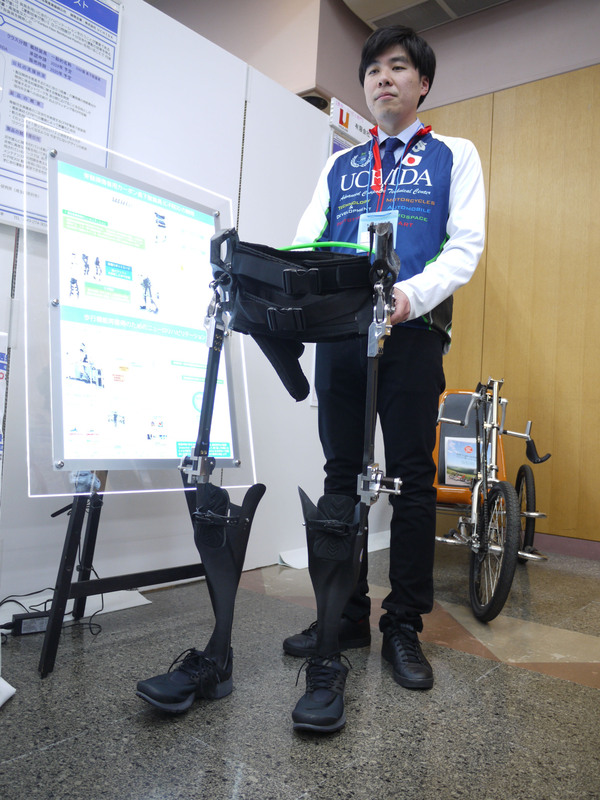 Prototype manufacturer Uchida Co., in the town of Miyoshi, is developing mobile suits for people who have suffered spinal injuries and are paralyzed from the waist down. Using carbon fiber, which is light and can be bent, the firm is testing the boundaries of how motorless exoskeletons can help wearers maximize their remaining limb functions. With a slim, sleek design, the firm’s product — named C-Frex and still under development — is aimed at letting users enjoy the experience of walking. Wearers have told the firm’s engineers that they can feel a sense of kicking the ground when using the equipment, as Its thin layers of laminated carbon fiber work like a spring, said Katsuyuki Hara, a technology development researcher at Uchida. “We have been asking Paralympic athletes to test our products and give us feedback every month,” Hara said. “Similar devices have been around for 20 years, but existing models were too heavy and made users exhausted,” Hara said. Saitama prefectural official Yoshito Yanagisawa said that small manufacturers have an agility that large firms often lack, and are comfortable serving niche markets — again unlike large manufacturers, which are often reluctant to invest in technologies that don’t yield big profits. “While small firms’ opportunities might be limited in Japan, they have huge potential if they can sell their products overseas,” Yanagisawa said.